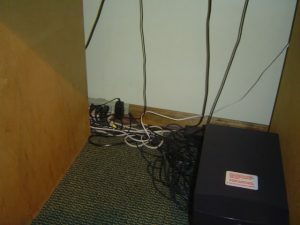 Imagine a computer desk or home theater system without the jumble of electrical power cords sitting below or behind it. Next, envision the day where you no longer need a cell phone charger cord laying on your kitchen counter or desk to charge your phone. Though these visions may sound like pure fantasies, believe it or not, the days of wireless electrical power are now upon on us. Companies such as WiTricity have been hard at work developing and recently demonstrating technology that will revolutionize how we power our consumer electronics, and even our automobiles. At the heart of WiTricity’s wireless electrical power technology is a magnetic resonating power source. The magnetic resonating power source transfers power from an electrical wall outlet via magnetic waves, over extended distances relative to the size of the power source. Resonant tuned magnetic wave capture devices integrated into the consumer electronics, and even electric automobiles, convert these magnetic waves back into electrical energy to power them. Depending upon the specific design features of the magnetic resonating power source and capture devices, the maximum operational separation distance between them can vary from a few centimeters to several meters. Besides efficiently transferring power, this type of wireless electrical power technology is ideal for the home. Magnetic waves easily pass through most home building materials such as wood, concrete, gypsum board and plastic. Consequently, there is no concern of requiring line-of-site alignment for this technology to work effectively. As a result of this technology, a small magnetic resonating power source could be located in one corner of a room, and all consumer electronic devices fitted with the capture device could be powered by it without the use of any power cords. In regards to electric automobiles, one of the biggest consumer complaints is that they have to make sure to plug the automobile into an electrical outlet once they pull into their garages. With wireless electric power technology this problem is solved. A magnetic resonating power source mat, if you will, can be located on the floor of the garage, and the automobile fitted with a power receptor capture device. When the electric automobile is driven over the power source mat the automobile begins to automatically recharge. As for safety concerns, unlike electric fields, magnetic files are consider to be scientifically safe with biological organisms. Relative to WiTricity they claim that any byproduct electric fields that are produced by their magnetic resonating source are almost completely contained within the source, thus causing no threat to humans, as well as no electrical interference to other electronics. In addition, WiTricity has stated that their products are being designed to be fully compliant to the relevant regulatory bodies such as the FCC and ICNIRP. So the days of electrical cord rat-nests appear to be numbered, and it cannot come soon enough. With today’s techno-cultured society, homes have become cluttered with wires lying all around them. Besides being unsightly, electrical cords create risks within the home, including fire and trip objects. They also add significant expense to consumer products as electrical wire is typically heavy gauged and well insulated. By employing wireless electric power we can potentially reduce energy costs, un-clutter our homes, and save on some of our natural resources such as copper and other products necessary for building power cords.